So, the next step in Kilkerran Week is......Work in Progress 4, or the WIP with the beige label. This release is much easier to find in the LA area. Off the top of my head, I can think of at least four spots that sell it, compared to zero that sell #2 and #3. 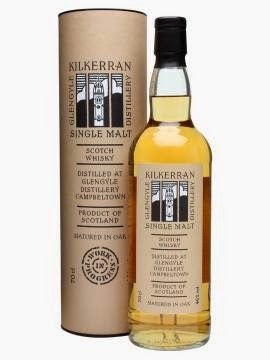 It was with this release that I saw local Kilkerran prices move from $50 to $60. That's actually not a complaint (if you can believe that), just an observation. The WIP releases were in fact getting older and a little more popular. It'll be interesting to see how their pricing structure evolves with WIP6. It will be a 10 year old, and Springbank 10 tends to be around $60 here. My guess is that it will be $70. But this 8 year old will tend to be in the $60 range. If you can find it for less count yourself lucky. I really overpaid for a sizable glass of WIP4 last year. It was very drinkable, though getting a nose on it was difficult using a wide tumbler in a fancy restaurant. Let me see if I can sort things out better utilizing a Glencairn glass in my whisky corner. The color is amber. If it's darker than WIP3, it's barely noticeable. The nose is the star of the show again: Pine, mint, eucalyptus, aloe?, moss, dried leaves; the forest floor. There's also some burnt paper and sugary barley. With some air, the whisky grows more floral, but not soapy. Some caramel sneaks in, along with whole grain toast, and a slight farmy note. The palate goes from hot cereal to creme brûlée. From breakfast to dessert. A slight IPA-like bitterness. Sweet barley stuff. Musky melon and maybe a little toffee pudding. Very mild overall. Watch out, oxidation silences it. Vanilla ice cream in the finish. And maybe a vanilla stout as it's kinda beer-ish. Toffee and barley. At first the nose is all barley. Maybe a caramel puff and a peat squeak. The floral and farm notes are still there, along with candle wax. The palate is quiet which may be due to oxidation comment above. There's yeast and vanilla. It's a little earthy and bitter. Maybe some lead? There's vanilla and fresh apricot in the finish, along with toffee. It's more tart than bitter.